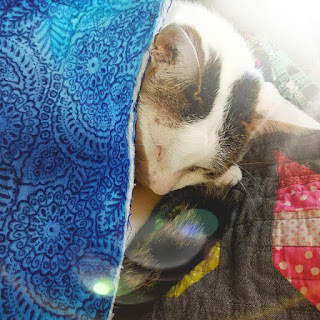 katiemaytoo quilts: VOTE! 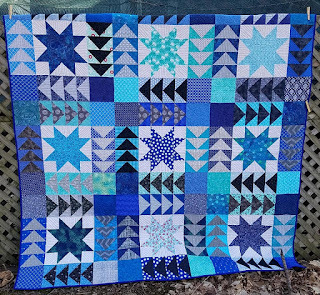 - and blue squirrel and a dolly quilt finished! VOTE! - and blue squirrel and a dolly quilt finished! It's time to vote again! This is the fifth of six challenges and again, anyone with computer access can vote for their ten favorites! 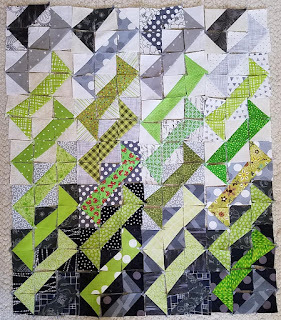 My quilt is #11 and you can read more about it in my previous blog post. (If you haven't already!) As always, there are a number of amazing entries, but you have until Friday to decide how to use those ten votes. Meanwhile, remember the blue squirrel from last January/February? That link takes you to the start of it, so you'll have to keep reading to see the whole quilt if you don't remember! 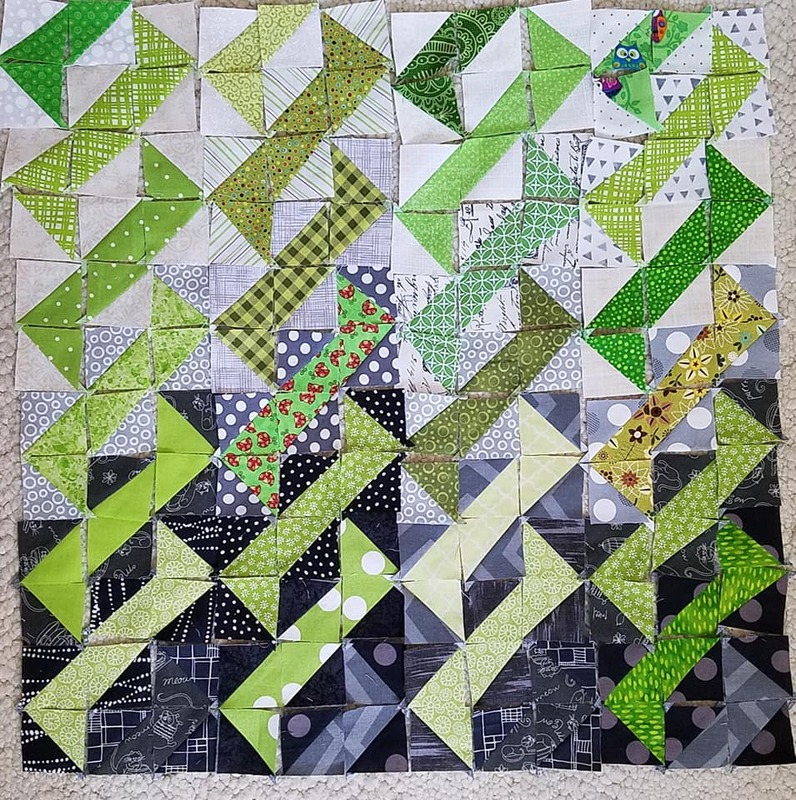 After some chores and such on Thursday...and finding my backing was NOT pieced as I thought...I got the quilt loaded. The colors here look fairly true. It was midday and sunny, so good natural lighting. 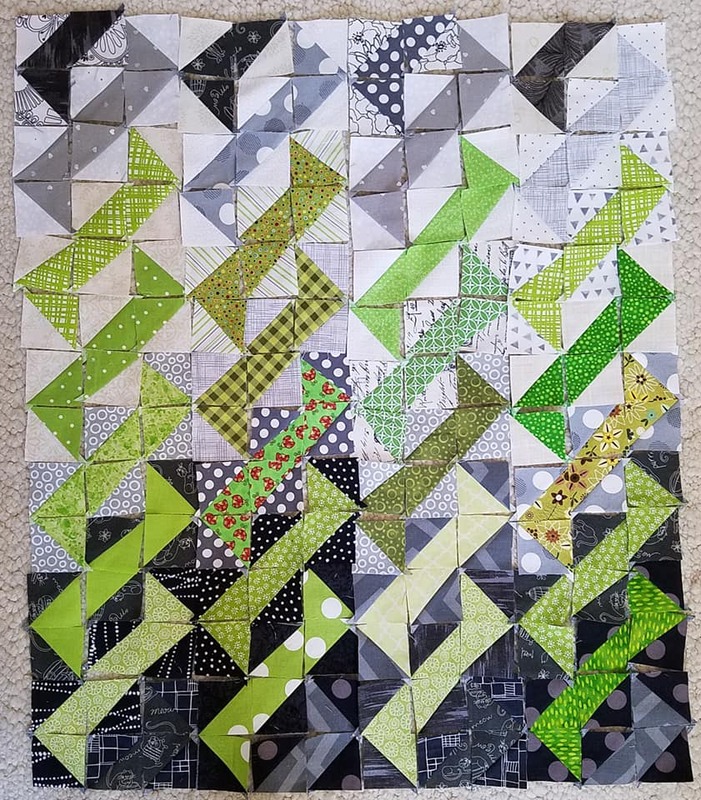 And I decided to do custom-ish quilting. Swirl hooks in the blue and just wiggly lines (for lack of a better term) in the grey/black/white. This all sounded good in my head. But those swirl hooks in small places take a lot of maneuvering and my elbow particularly was getting tired. And it took nearly six bobbins. And about 6 hours. 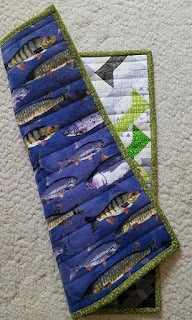 I had intended, after quilting and trimming, to sew the binding on (prepared shortly before I started quilting) and maybe even start the hand-sewing side. It was 9pm by the time I got to that point. My elbow hurt. My whole body was sore. (I even remembered to wear good shoes!) I needed to rest. And sleep. So I did. Friday I tackled the binding! I had to work Saturday, and had a meeting at the crack of dawn Sunday at work (who schedules a 7am meeting on a Sunday the SAME DAY we lose an hour because of Daylight Saving Time? 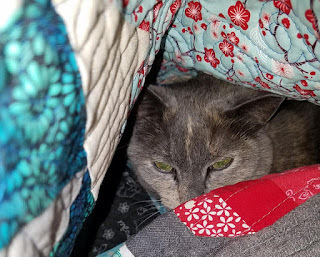 )...but it got me up and early and chores done, so when the hubby left for work (it was his weekend in the rotation), I was able to plunk down on the couch, request some Gilmore Girls from Netflix, don my thimble and bind, bind, bind! 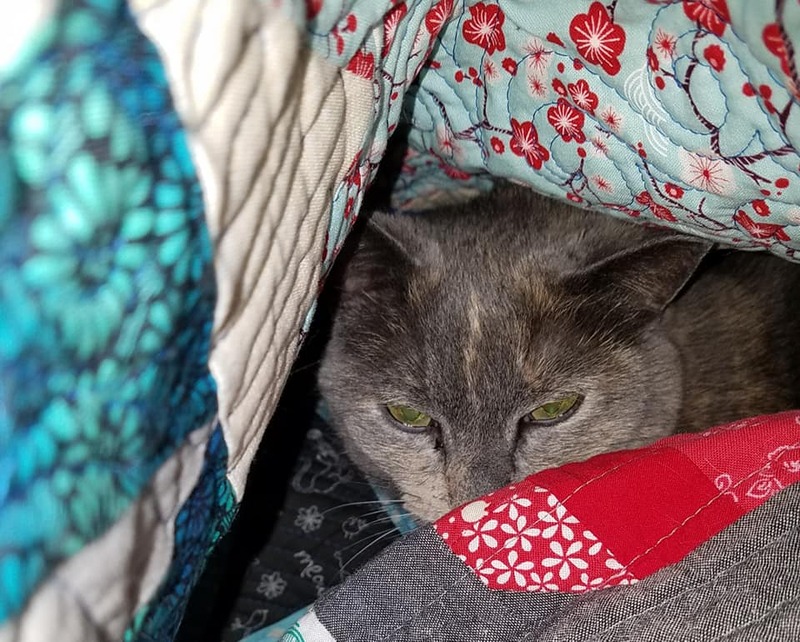 The other three cats also did their part, but did not burrow or fall asleep, they just tried to steal pins, demanded pets and generally behaved in an annoying manner for a short while. But I did finish! It was about 7pm last night and as I looked up, I realized it was still light out! I hate the time change, particularly the one that loses an hour of sleep, but it was very nice to not be in darkness so early any more! 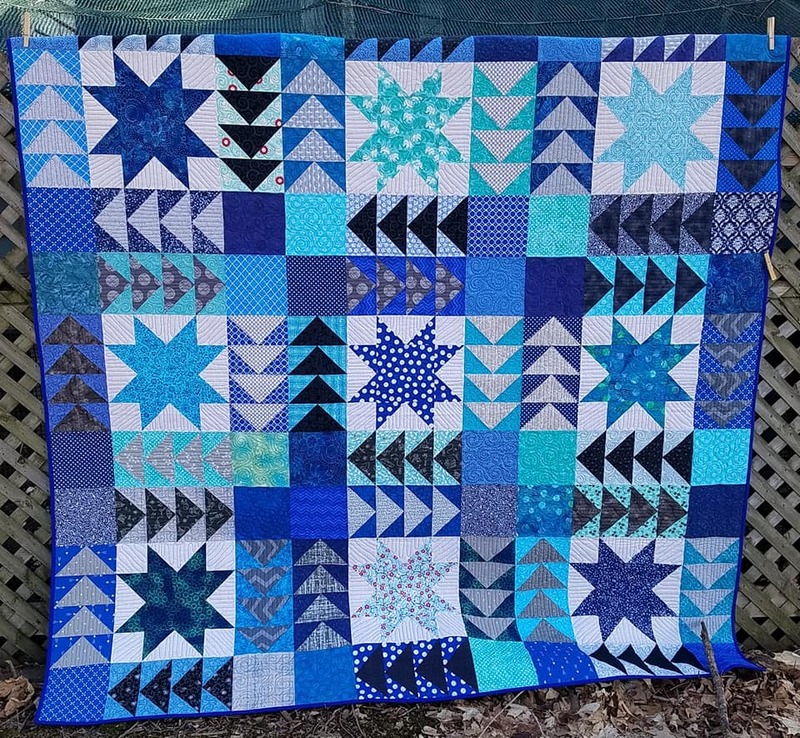 I ended up pinning it to the fence that encloses the outdoor cat playland because the winds were enough that I wasn't able to get a less-action-y shot of the quilt for you all on the clothesline. The blue squirrel is complete! It looks kinda like a batik, but it's not. It's flannel! Snuggly, cozy, fluffy flannel. I think that helped keep Emma happy and sleepy for so many hours as I worked. So yay for a finished squirrel AND a reduction in the Rack of Shame. The mid-weekend project was a dolly quilt. I have a little list in my sewing room of random projects that need to be done. I add a thing or two every time I cross one off. And they're things like "pink pinwheels" or "green HSTs" that remind me of stuff that needs to be made into something. The bag and dolly quilt made from the pink pinwheels was one from the list. 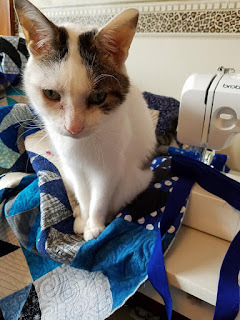 These are items that are easily overlooked in the pursuit of other, larger, more demanding projects, but my sewing space is becoming littered with their kind and something needs to be done. So this little list helps me have direction when I walk into the room with no particular agenda. 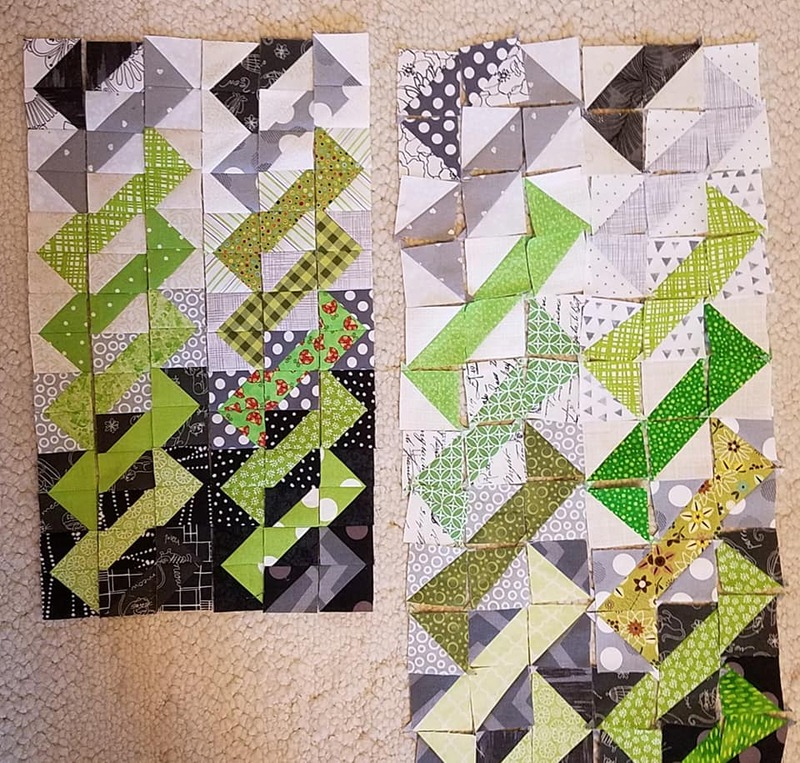 The current item at the top of the list are the green "lost corners" left from my green X-Plus quilt that I made the blocks for at retreat earlier this year. There are a LOT of them. Each block lost 8 corners. And there are 49 blocks. I'm not going to do the math. I don't want to know. So I started looking around the internet, hoping for something OTHER than pinwheels. It seems that's my go-to for these little units and I wanted something more interesting. I also knew I had some that were green-grey, some that were green-white, some that were green-black, some that were grey-black, and some that were grey-white. Now, with 8 of each set, I could make two pinwheels of each colorway, but nope. I happened across a few photos that looked like twisted ribbons that looked interesting. And then I thought maybe I could grade the colors a little for a bit of an ombre look? Each of these squares still needed to be trimmed (1.75" before sewing) and then carefully sewn in the right direction. Then pressed, also in the right direction for ease of assembly later. Look how much that shrinks after trimming and sewing! Holy cow! But I knew what size it was going to be when it finished, so this wasn't too worrisome. 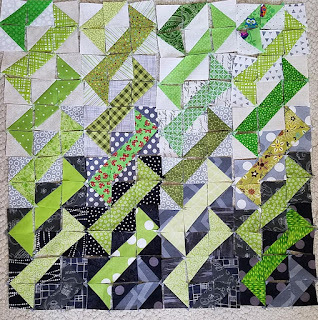 Once the columns were sewn into units (hubby said they look like tank tracks, I think it maybe looks a bit like a DNA molecule), I started wondering if I should add sashing. 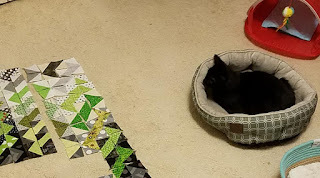 A good black-grey ombre fabric would be great here, but I am NOT buying more fabric for a project that is supposed to be using up fabric! So let's do an audition! I thought green would be too much, so maybe something totally different like blue or red? Nope, not once I saw it through the lens of the camera. 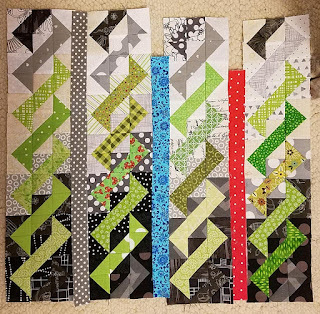 The grey was my favorite of the bunch, but still seemed to break up the ombre-ness that was present, so I decided to just full-steam ahead sew the columns units together. My original idea was to echo the green design about 1/4" inside. 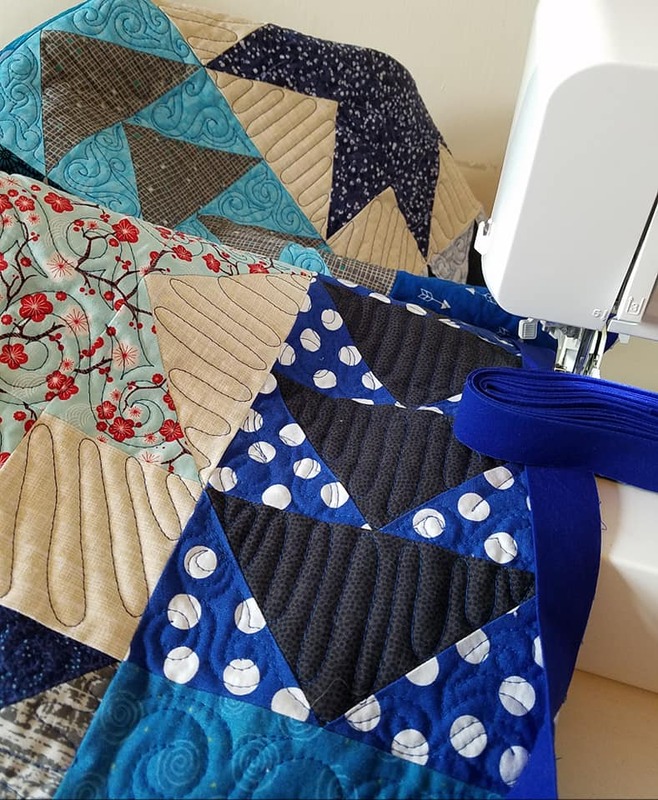 But after realizing how many seams there were in places, and knowing my little machine would probably throw a few temper tantrums (I might, too...), I decided simpler was better and went with a horizontal line through the centers of all the half square triangle units. 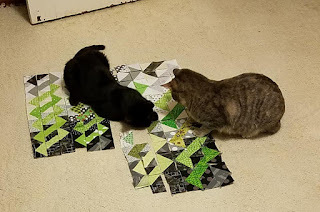 I debated doing vertical lines, too, but decided it was held together enough for a dolly quilt and there was no reason to tempt fate with further opportunities for puckers! Leftover fish from the blue heart quilt! And FINALLY, the charity thing I mentioned way at the beginning. The one that needed batting. Last year at this time, I was getting ready to give my notice at work. But I was still working. A lot of hours. And I was still stressed out and not doing much most days. But I WAS reading blogs. I came across Confessions of a Fabric Addict's charity quilt challenge and thought it was a wonderful idea. But there was no way I could participate. I found it late and was working and you know the string of excuses... But I decided I would think forward and be ready for this year. Perhaps even donate all on my own to Jack's Basket - one of the chosen charities that hit close to home for me. ...apparently I have four more to quilt. Two are done-done. So I'll have six to send! This year, I'm ready. I have the time. I have tops ready and batting ready and should be able to find enough for the backs of these in my stash. I signed up for the challenge. And now what am I doing? So now, it's time to go find backs. 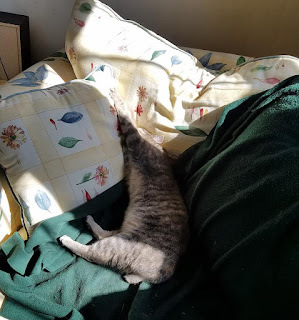 But first, a few more cat photos. 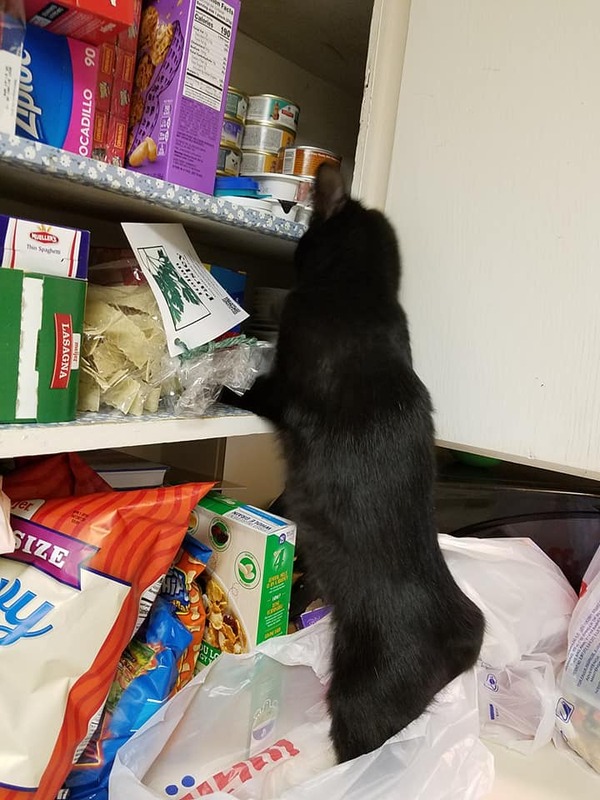 Because I can't leave you without those, can I? Yea! ! ! Blue Squirrel done! ! ! 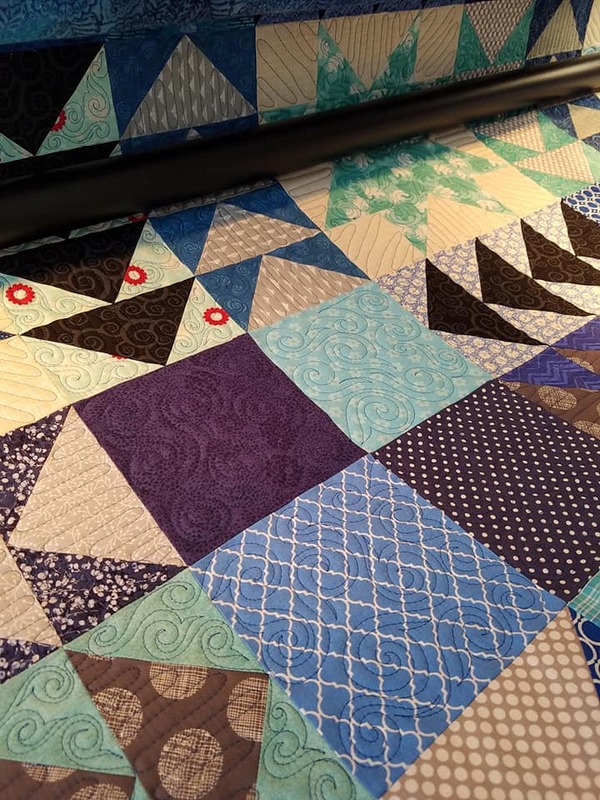 There are some gorgeous blues in the quilt and it is so pretty. Great job on that one. You are so creative with ideas to use up left over bits. 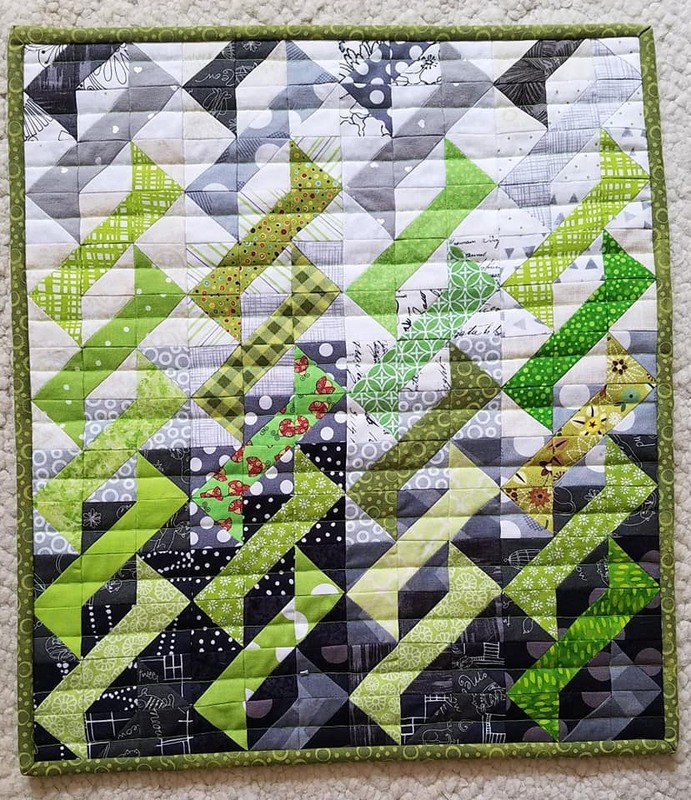 The little green quilt is adorable! 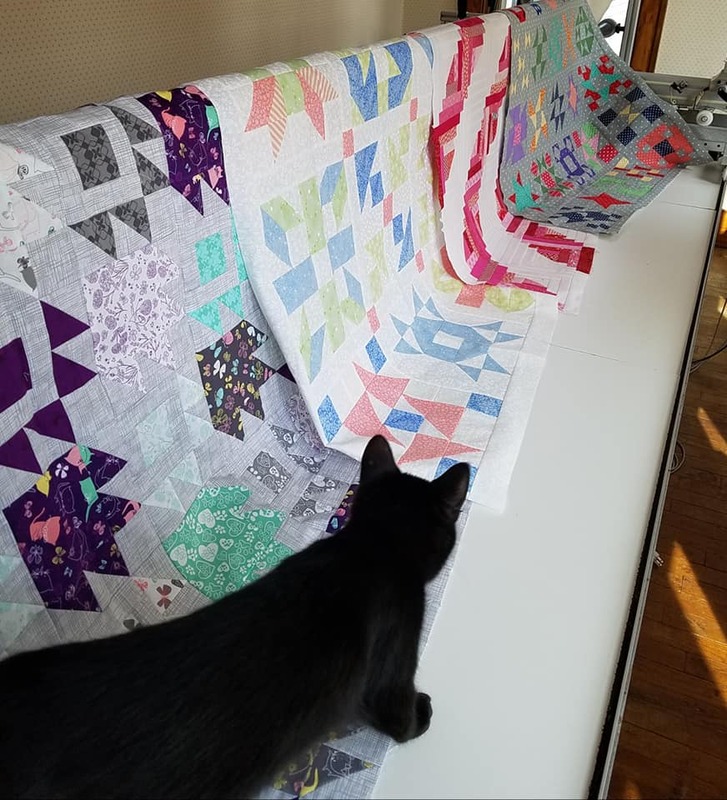 With a time to have the charity quilt mailed, you will get them finished. They are so cute hanging together, now for some backings. 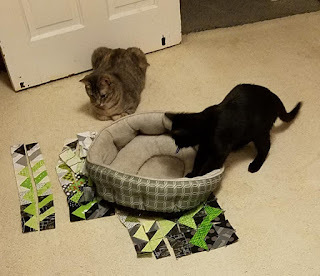 Kitties are adorable as always, it is fun to have so much help! ! ! If you run out of 'lost corners', I know where there's a bunch just sitting around just down the road from you :). Yep, I voted for you, too... again, it was a struggle finding 10 that I liked well enough to vote for. 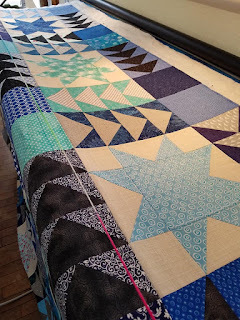 :( The blue quilt looks GREAT! 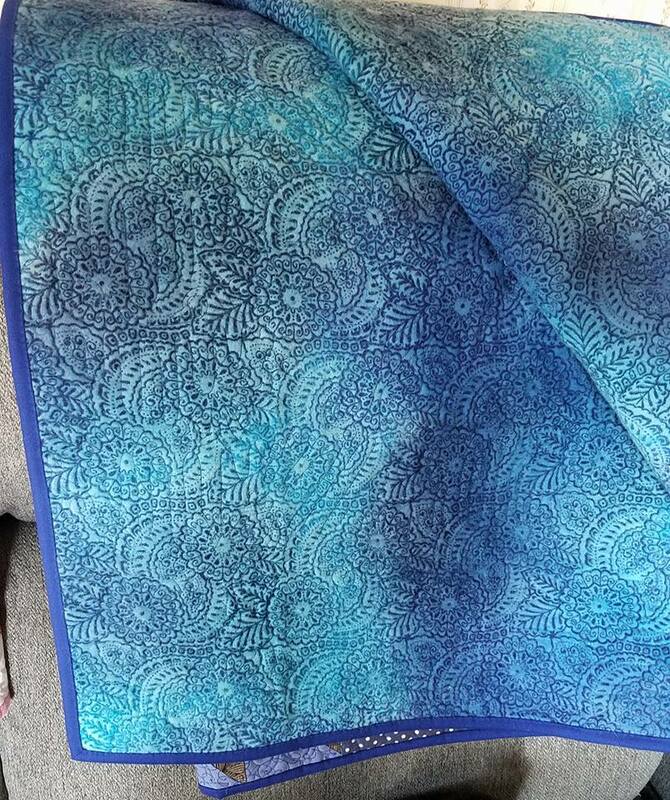 I think you've killed the blue squirrel; what I saw was a beautiful blue quilt! The little green one is very nice too. 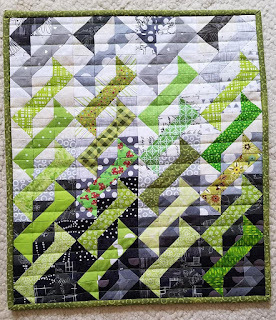 Your braille quilt simply amazes me! And yes, I voted for it too! I don't know how you come up with such unique ideas! Just really smart I guess. Have fun with your quilting, and with your kitties too! ---"Love"